EURUSD is testing 1.1176 support, a breakdown below this level would signal resumption of the long term downtrend from 1.2555 (Feb 16, 2018 high), then further decline to 1.1000 area could be seen. 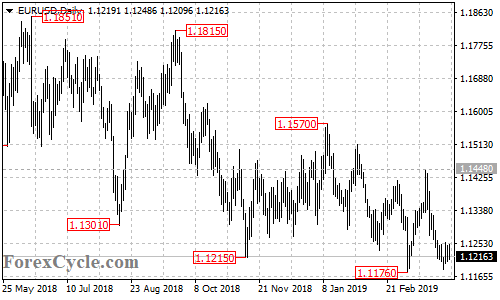 Key resistance is at 1.1448, above this level would indicate that the downtrend had completed at 1.1176 already, then the following upside movement could bring the price back towards 1.1700. Previous Previous post: Falling Trade Deficit is Good for Stocks: True or False?